This one's easy. When a watermelon has developed properly, the spot it was resting on in its field will have a yellow, cream-colored, or off-whitish underbelly. Make Sure your melon has at least a small spot like this. Sometimes it will be at an odd spot on the melon, but that's ok.
One of the biggest problems with industrial farm-grown fruit is it's often picked too early, and watermelons are no exception. 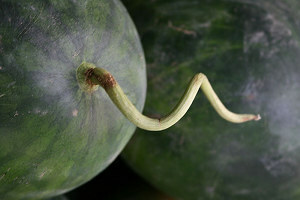 When a watermelon is fully ripe and done developing, the vine that it's attached too will generally wither and start to detach at the fruit's, "belly button." Ripe melons are easy to pick, and will usually just pop right off the vine. Eager to get the melons to market, though, industrial-scale farmers often yank melons off the vine before the crop has reached complete ripeness. Usually the vine breaks off from the plant farther up from the "belly button," and this bit of vine will still be attached to the melons in the store. Usually it's curled up and dry, and appears like a curly pig's tail. When you see the tail, avoid the melon. Does the Overall Color Matter? Sometimes when I'm selecting watermelons I notice a substantial difference in the green hues of the various melons. Some are almost white, some are very green, and the rest fall somewhere in the middle. As far as I can tell, there seems to be little difference in taste or consistency based on color, although I'm open to other suggestions. I've noticed that when I grow small watermelons in my garden, the same variety of melons growing right next to each other will often have significant color differences, and again, I don't notice a difference in edibility. I was surprised to learn a few years back that ripe, unrefrigerated watermelons actually take a long time to spoil. How long? Certainly at least several weeks if they remain unopened in a dry place. I've never actually had one go bad on me, so I can't say. One raw foodist I know buys an entire pickup truck-bed of them from a local farmer at the end of the watermelon season in September. He insists they're still good over a month later. While I think a month might be pushing it, there's certainly a lot of leeway in how long you can keep them. Watch a video how to pick a watermelon. Learn more about picking and storing the large amounts of produce you'll eat on a raw food diet. 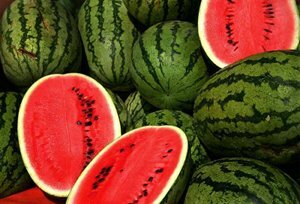 Read some interesting information about watermelons.